The rock pioneer will be honoured by the hall as part of its American Music Masters series. Berry was inducted into the Rock and Roll Hall of Fame in 1986. In October, the icon will be the subject of a week-long celebration by the hall and Case Western Reserve University. It kicks off on October 22 and ends with an all-star tribute concert on October 27. Performers have yet to be announced, though Berry is set to take the stage. 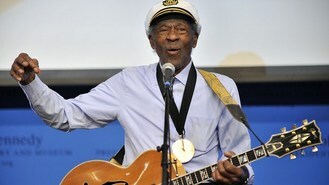 In a statement, the 82-year-old Berry said he is "looking forward to reelin' and rockin' in Cleveland". Past honourees include Aretha Franklin, Janis Joplin and Woody Guthrie.